Let me start out with saying, I know some of you reading this are caught up in Sasquatch Ontario's BS but as most of my readers know, I call it like I see it. And I see it as a just another Hoax. This guy lost me when he claimed that Bigfoot gifts him marbles and silk flowers. Do they rob stores or houses to get their supplies? Do they just carry these items around until they find that special someone to give them to? Now to top it off he says he plays tic-tac-toe with them. lol This guy is just seeing how far he can take this. And of course he screens the comments on his Youtube channel so that only the ones that praise him are shown. He has blocked and banned so many people for challenging his claims. I've noticed now on facebook he is defending his claims at every corner. He is on constant damage control. He claims to have this amazing relationship with these creatures and records all sorts of vocalizations but can't get us one picture or any DNA? Here is a video breakdown on his material as well as a funny one. Townsend Media also does some breakdowns on his claims. "Although many of you have been comparing our material, I saw no parallels. His material is relegated to two individuals that produce vocalizations, which is very unusual over a course of many encounters. I also didn't believe the vocalizations and saw a pattern of borrowing material from others in what I consider (my opinion) to be a fabrication of encounters. Nonetheless, I put his audio to the test. I chose the audio that sounded incredibly like the landowner. So take a listen." This is a compilation of prints, vocals, and activity from the last few visits. Including a response vocalization. I guess he gifted himself with the silk flowers!! Check out this song by a Christian speed metal band. The song begins with audio of what is supposed to be demons waiting to be conjured up or awakened. Sound familiar? You people are a real JOKE! 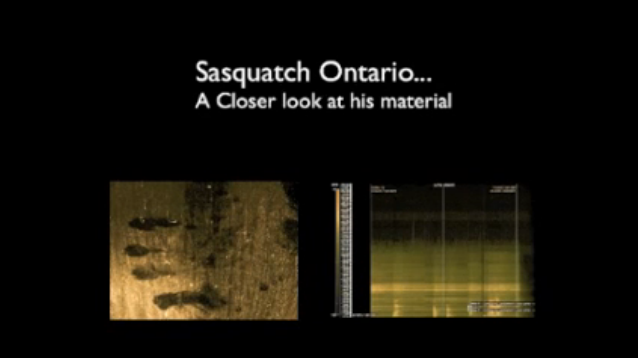 If you think Sasquatch Ontario is a hoaxer, then it just shows how ignorant, jealous, and unintelligent you people really are! Idiots! THANK YOU...THIS IS ABSOLUTELY REAL EVIDENCE...ANYONE "INTELLIGENT" CAN SEE THAT.. In the above link and video @ 10:18 people can be heard whispering something like "owe... how many more?" "I'm going to ask them to make some kind of noise" then another guy says in a whisper "Just a second" then you say "are you ready?" and the other guy says "Go ahead"
If you listen to the 20 seconds before this exchange and listen to the sasquatch you can hear a kind of bluesy musical quality to one thing the sasquatch says... it sounds like breathe... flower... a ... gain... not what is being said but just so you know what i'm referring to it's the part right before the so called small series of vocalization that says ends with flower really loud. On his 2015 last visit video, Mike and his friend are looking at many bigfoot prints in the snow. Mike's friend who is with him is helping measure the footprints, and occasionally you hear him speak. His voice is deep and projecting. His voice is extremely similar to the bigfoot audio. I'll bet he is speaking in a microphone with a speaker in the nearby wooded area making the grunts, gibberish, and English words thrown in. Give a listen, his friend with the deep voice never speaks when the bigfoot vocals are recording.